The government has previously trumpeted its “special case” for receiving money back through EU investment funds to compensate for its repayment of international bondholders, whose investments would normally have suffered heavy losses. However, in a significant u-turn, the government has said it will instead focus on selling its share in the three surviving banks: Allied Irish Banks, Bank of Ireland and Permanent TSB. 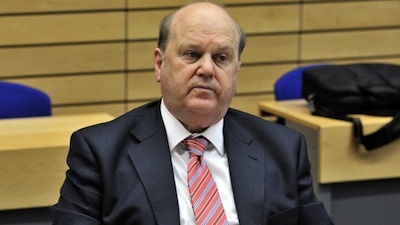 Writing in the Irish Times, Mr Noonan said he believes that the thirty billion euro pumped into the three banks since the banking crisis could be returned to the state over the next ten years “if economic and trading conditions continue to improve”. His statement has also confirmed that the 35 billion euro pumped into two other dissolved banks, Anglo and Nationwide, is now irretrievably lost. Sinn Fein Finance Spokesperson Pearse Doherty described Noonan’s article as a “an attempt to turn a clear defeat into some sort of victory” and “a surrender letter”. “In June 2012 we were told there had been a seismic shift and Ireland was in line for special treatment. Now that lie has been exposed,” Mr Doherty said. “Ireland will get no break from the EU. On the issue of the Irish people being paid back... the government has surrendered to the EU. He described the promise of future returns on its bank ownership as “very optimistic” and “incredible spin”. The real cost to the Irish people of sustaining the failed banks was directly linked to the austerity budgets, to the cuts to our health service and to water charges, he said. Speaking subsequently at the Dublin parliament’s official inquiry into the banking collapse, Central Bank governor Patrick Honohan said the cost of bailing out the banks is likely to be 40 billion euro. And he admitted that Anglo Irish Bank, the most hopelessly insolvent of the five, should have been allowed to fail. Mr Honohan said it should have been clear to the financial authorities that the bank was going bust. Asked by Fianna Fail’s Michael McGrath if Anglo should have been allowed to fail in September 2008, Prof Honohan replied “Yes, certainly”. He said there should have been an intervention and the management of Anglo should have been removed. Mr Honohan said Ireland got a “bad rap” for introducing a guarantee. He said the 26 County State would have been viewed even poorly internationally for saying “to hell with the bondholders” and liquidating Anglo, but this did not make it the wrong call. “It would have been seen as the European Lehmans and the government would have been pilloried. That doesn’t mean they shouldn’t have done it,” he said.